Fears of a massive unaffordable pensions blowout in future may be easing as analysis suggests a sustainable solution is achievable. Measures proposed by the Retirement Commission are estimated to cut the cost of NZ Super to about 6.5 per cent of GDP by 2060 – a level seen as costly, but affordable. Retirement Commissioner Diane Maxwell said the measures were designed to be the last big changes needed to make the universal state pension sustainable in the face of an ageing population. Her comments follow analysis from the University of Auckland’s Retirement Policy and Research Centre showing a consistent decline in Treasury’s estimates of the future cost of NZ Super. On Wednesday in the Focusing on the Future report the Commission for Financial Literacy and Retirement Income proposed progressively raising the age of eligibility for NZ Super (currently $21,336.64 before tax for a person living alone) as life-spans increase. It also suggested changing the way annual rises in payments are calculated. The effect would be a gradual rise in the age of eligibility to 66 by 2036, 67 by 2046 and 68 by 2056, giving everyone time to save bigger retirement nest eggs. It would also mean NZ Super would no longer keep pace with average wages. But though there are no forecasts in the commission’s report, the Sunday Star-Times understands the commission believes its proposals would drop the projected gross cost of NZ Super in 2060 from 8 per cent of GDP, as projected in the Treasury’s Affording Our Future report, to around 6.5 per cent of GDP. After tax, the figure would be lower still. Should Treasury forecasts prove wrong then further changes could be necessary, but the commission believes these would be of a much smaller magnitude. Whether the commission proposals will be implemented is moot, however, as the government has dismissed raising the age of eligibility, arguing NZ Super will remain affordable if Governments remain fiscally responsible. By contrast, Labour’s policy is to lift the age of NZ Super. Doom-mongering over the future of NZ Super has been intense in recent years, and many younger people now appear to believe universal NZ Super will one day be scrapped, leaving them to fend for themselves when old. Maxwell dismissed that. “NZ Super will be here in the future, but the role of private savings will increase,” she said. And the level of pessimism about NZ Super appears to missone striking feature of cost projections for NZ Super from Treasury: the fact that they have been dropping for the past 13 years. 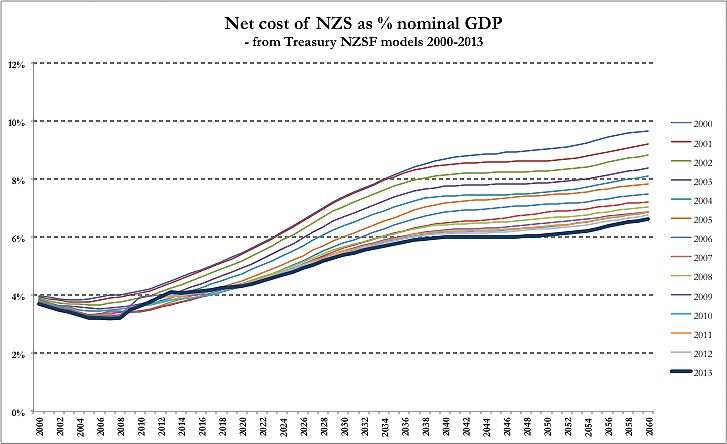 But they also show a trend of revising down estimates of the future cost of NZ Super, net of tax. “Between 2000 and 2013, the 2060 projection fell from an estimated net 9.7 per cent of GDP to 6.6 per cent in 2013, an apparent reduction of 32 per cent in 13 years,” said Littlewood in his recent paper. The changes are largely a result of projections for higher GDP and people staying in the workforce for longer, but forecasting is an inexact science, and Littlewood says forecasting ahead 40 years is “ambitious”. Currently NZ Super costs about 4.8 per cent of GDP, gross, or 4.1 per cent net. Much can change in 40 years. Earthquakes can strike, bovine disease break out, a volcano erupt, medical advances push out longevity, or a pandemic reduce the over 70s population. Pensions defender Alec Waugh, a former high-ranking policemen who founded the KiwiSaver, Annuity, and Superannuation Protection Association of New Zealand, has grown tired of what he calls NZ Super “doom-mongering” by vested interests talking up the future costs into a crisis to scare the country into policy cutting NZ Super and forcing people to save more. He’s particularly suspicious of long-term forecasts which he believes are easily manipulated, especially by using gross cost projections, conveniently forgetting that NZ Super is taxable so the net cost is lower. But some of the projections being bandied about are even longer. The Financial Services Council, a lobby group for fund managers and insurers, is using a 10 per cent of GDP figure, but it is talking about 2110 – a projection of just under 100 years. The FSC also uses a “very low mortality” model, arguing we have underestimated mortality gains. “If people who are low-balling are wrong, we run out of time,” FSC chief Peter Neilsen says. Maxwell has identified a window of four years to make changes, or more drastic change would be needed. Neilsen says more needs doing, including compulsory KiwiSaver with higher savings rates. The other big NZ Super threat was that it was about half what people believed they could live on. When older people choose the Government, he foresees intense pressure to lift NZ Super. This entry was posted in KiwiSaver, NZ Super, Private Super Schemes, Uncategorized on October 14, 2013 by swlthll.